This review aims to create an overview of the currently available results of site-directed mutagenesis studies on transient receptor potential vanilloid type 1 (TRPV1) receptor. Systematization of the vast number of data on the functionally important amino acid mutations of TRPV1 may provide a clearer picture of this field, and may promote a better understanding of the relationship between the structure and function of TRPV1. 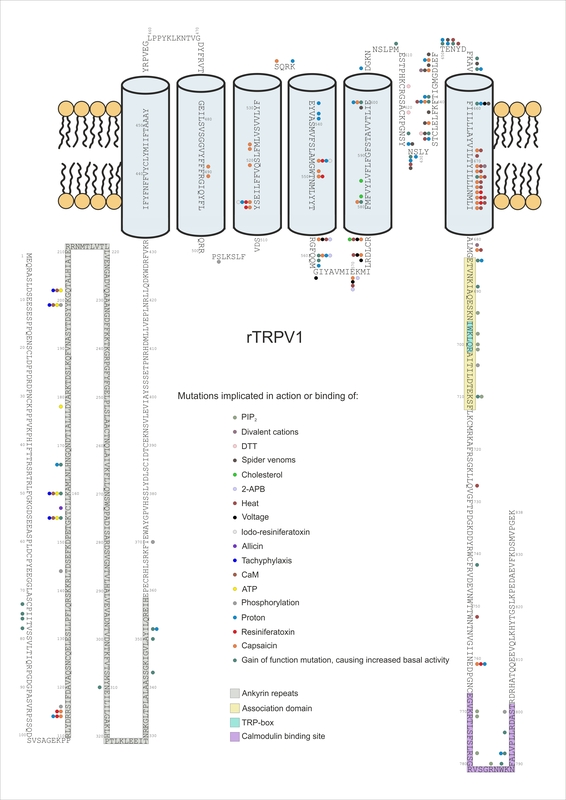 The review summarizes information on 112 unique mutated sites along the TRPV1, exchanged to multiple different residues in many cases. These mutations influence the effect or binding of different agonists, antagonists, and channel blockers, alter the responsiveness to heat, acid, and voltage dependence, affect the channel pore characteristics, and influence the regulation of the receptor function by phosphorylation, glycosylation, calmodulin, PIP2, ATP, and lipid binding. The main goal of this paper is to publish the above mentioned data in a form that facilitates in silico molecular modelling of the receptor by promoting easier establishment of boundary conditions. The better understanding of the structure-function relationship of TRPV1 may promote discovery of new, promising, more effective and safe drugs for treatment of neurogenic inflammation and pain-related diseases and may offer new opportunities for therapeutic interventions. 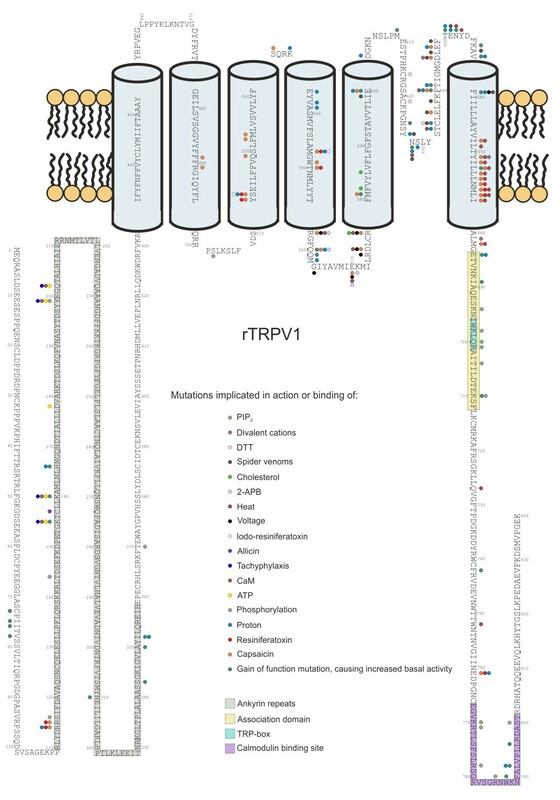 This review aims to create an overview of the currently available results of site-directed mutagenesis studies on transient receptor potential vanilloid type 1 (TRPV1) receptor. Systematization of the vast number of data on the functionally important amino acid mutations of TRPV1 may provide a clearer picture of this field, and may promote a better understanding of the relationship between the structure and function of TRPV1. The first few sections provide a brief introduction of the transient receptor potential family and the TRPV1 ion channel. The following sections compile the positions crucial for the different channel functions and the amino acid changes of these 112 unique mutated sites of TRPV1. The information collected in this form may serve as a powerful tool for in silico molecular modelling by facilitating the establishment of boundary conditions. All mutations and positions discussed in this paper generally refer to the rat ortholog (rTRPV1) of the TRPV1. All results relating to other species will be highlighted in the text. The first TRP channel was discovered in 1969 by Cosens and Manning, who isolated a mutant photoreceptor from Drosophila melanogaster, which caused the specimen to become temporally blind upon exposure to bright light [1, 2]. TRP channels are one of the largest families of ion channels. The mammalian TRP superfamily consisting of 28 TRP cation channels can be subdivided into six subfamilies: the TRPC (“Canonical”), TRPV (“Vanilloid”), TRPM (“Melastatin”), TRPP (“Polycystin”), TRPML (“MucoLipin”) and the TRPA (“Ankyrin”) groups [3, 4]. All TRP channels are tetramers assembled with fourfold symmetry from the individual subunits containing six putative transmembrane segments (TMs). The region between the fifth and the sixth TMs, including a putative pore loop, forms the ion permeation pathway . The amino and carboxyl (N- and C-) termini are located intracellularly and vary vastly in length and amino acid sequence. These cytoplasmic regions contain diverse well-recognized domains and motifs that are likely to be involved in channel assembly, activation and regulation through protein-protein and/or protein-ligand interactions. Most TRP channels are cation-selective, and some are highly selective for Ca2+ or Mg2+. In accordance with their amino acid sequence diversity, TRP channels exhibit various activation and modulatory mechanisms, such as those involving in the stimulation by G-protein-coupled receptors, extracellular and intracellular ligands (including H+, Ca2+ and Mg2+), phosphatidylinositol-4,5-bisphosphate (PIP2), temperature, and mechanical stretch . The accumulating evidence that TRP channels are important components of several human diseases has created a huge interest for these channels as novel potential drug targets. Comprehensive reviews have been published on the modulation and potential pharmaceutical application of TRP channels [7–11]. The TRPV family includes six mammalian ion channels, TRPV1-TRPV6, with a large C- and an even larger N-terminal cytoplasmatic domain containing ankyrin repeat domains (ARD) [12, 13]. Ankyrin repeats, the 33-residue sequence motifs, are essential in channel function, ATP, PIP2, and calmodulin (CaM) binding  and protein-protein interactions [15, 16]. They are present in many proteins, with functions including signalling, cytoskeleton integrity, transcription and cellular localization [17, 18]. As polymodal thermo- and chemosensitive channels, TRPV1-TRPV4 are non-selective for cations and modestly permeable to Ca2+. In contrast, TRPV5 and TRPV6 are the only highly Ca2+-selective channels in the TRP family, and both channels are tightly regulated by the intracellular Ca2+ concentration [10, 19, 20]. TRPV channels can be activated through a variety of mechanisms. TRPV1-TRPV4 can act as thermosensors at a molecular level. Interestingly, each of these channels has a different thermal threshold for activation. When expressed in transfected permanent cell lines (HEK293 and CHO cells) and in frog oocytes [4, 21, 22], TRPV2, TRPV1, TRPV3 and TRPV4 are activated at 52°C , 43°C, 33°C, and below 33°C, respectively. The TRPV family members, except for TRPV1, are insensitive to vanilloid compounds . TRPV3 can be activated by essential oils from clove (eugenol), thyme (thymol) and oregano (carvacrol) . Like TRPV1, TRPV3 is also activated by camphor . TRPV4 can be activated by cell swelling caused by 5',6'-epoxyeicosatrienoic acid . TRPV5 and TRPV6, originally named ECaC  and CAT1 , are Ca2+ entry channels responsible for Ca2+ absorption in the kidney and intestine, respectively. In 1997, the breakthrough work of Michael Caterina and colleagues in the field of somatic sensory biology and pain research led to the cloning of the vanilloid (capsaicin) receptor, TRPV1 . The cloning of TRPV1 proved to be a significant step in the understanding of molecular mechanisms that underlie the transduction of noxious thermal and chemical stimuli by sensory neurones . As a TRPV subfamily member, TRPV1 can be characterized by some key properties that are common among the members of the family. It is built from four individual subunits containing six TMs . TRPV1 has a pore-forming hydrophobic stretch between TM5 and TM6 and is believed to exist as a homo- or heteromeric complex form [28–30] (Figure 1). Summary of the mutated sites of rTRPV1 The figure summarizes the effect of 112 unique mutated sites along the rTRPV1 on the function of the channel. Coloured circles indicate the involvement of the given residue in the corresponding process. Coloured boxes show the putative location of some structural elements on the rTRPV1 sequence. Sequence and region information: TRPV1_RAT (O35433) (http://www.uniprot.org). The TRPV1 receptor is a non-selective ligand-gated cation channel with a ninefold higher permeability for Ca2+ than for Na+. It is an integrator of a wide variety of exogenous and endogenous physical and chemical stimuli, including capsaicin (CAPS), noxious heat (>43°C) and protons (pH<5.2). Strictly speaking, CAPS and its biological analogs isolated from plants and animals are essentially sensitizers, because they act by lowering the thermal “physiological” activation threshold of TRPV1. Nevertheless, because these compounds bind directly to TRPV1, they are conveniently considered as direct activators, in contrast to compounds that do not bind TRPV1 and affect its functioning indirectly, which are referred to as sensitizers . Besides CAPS, many complex amphiphilic molecules have been shown to activate or inhibit TRPV1. These include polyring compounds such as resiniferatoxin (RTX), a highly irritant diterpene related to the phorbol esters  which is almost 20-fold more potent than CAPS . Species-specific differences in RTX potency have also been described, for example, RTX is a more potent agonist on rTRPV1 than its human ortholog (hTRPV1) [34, 35]. Further molecules with similar structures, such as quinazolinone , evodiamine  and 17-β-estradiol , as well as molecules with long acyl and amide chains, such as anandamide [39–45], olvanil and omega-3 polyunsaturated fatty acids can also activate the channel . Other natural TRPV1 agonists are 12-hydroperoxyeicosatetraenoic acid (12-HPETE) and N-arachidonoyl dopamine (NADA) [42, 47–49]. Piperine from black pepper, eugenol from cloves and zingerone from ginger have also been shown to activate TRPV1 [50, 51]. Additionally, gingerols, present in raw ginger, and shogaols, which are dehydration products of gingerols present in steamed ginger, both of which possess a vanillyl moiety, also activate TRPV1 [35, 45, 52, 53]. Since both CAPS and its analogues are lipophilic, they are able to cross the cell membrane and act on binding sites present on the intracellular surface of TRPV1 . TRPV1 can also be activated by 2-aminoethoxydiphenyl borate (2-APB). 2-APB inhibits both IP3 receptors and the majority of TRP channels, though at higher concentrations it activates TRPV1, TRPV2 and TRPV3 [11, 55]. There has been debates about whether TRPV1 can [56–59] or can not [60–63] be activated by AITC. Stimuli are detected and transduced through opening of the ion channel, which results in the entry of cations such as Ca2+ and Na+ to the neurone . Due to its uniqueness in its diverse operational features, which differ from the classical, more restrained proteins of voltage-gated and ligand-gated channels, as well as from the G-protein-coupled receptors, TRPV1 was dubbed “multisteric nocisensor” in the recent review paper by Szolcsányi and Sándor . The inorganic dye Ruthenium Red (RuRed), is used in histology to stain aldehyde fixed mucopolysaccharides. Long before the cloning of TRPV1 RuRed was demonstrated to be able to inhibit CAPS-induced responses in sensory neurones . Later it was shown that RuRed is a non-competitive antagonist not only for TRPV1 but for most other TRP channels functioning as a pore blocker . The first competitive antagonist identified for TRPV1 was the CAPS analogue capsazepine (CapZ). CapZ is a relative potent antagonist on hTRPV1 but demonstrated much less potency on rTRPV1 [66, 67], illustrating the differences between species that is common for many TRPV1 antagonists. Since the discovery of CapZ the number of TRPV1 patents has exceeded 1,000. Most of these antagonists show high affinity to TRPV1 and are competitive antagonists binding to the same site as CAPS and many of them have also demonstrated in vivo effects in various pain models . The halogenated version of RTX, iodoresiniferatoxin (I-RTX) has been identified as a high-affinity antagonist of the TRPV1 channel and similarly to RTX, it also exert different potency on the hTRPV1 and rTRPV1 . R4W2, a small positively charged peptide was identified to be non-competitive antagonist blocker of recombinant TRPV1 channels expressed in Xenopus oocytes , blocking CAPS-operated ionic currents with micromolar efficacy in a weakly voltage-dependent manner. R4W2 was later found to be competitive antagonist of TRPV1 also in primary cultures of adult rat dorsal root ganglion neurons (DRGs) . Besides its involvement in pain sensation, TRPV1 displays a low level of activity at normal body temperature [72, 73]. Constitutive activity of TRPV1 is essential for regulation of body temperature, evidenced by high fever as a adverse side effect of many TRPV1 blockers during clinical trials for their efficacy in management or prophylaxis of pain [74, 75]. Moreover, at room temperature (24°C) and pH 7.3, TRPV1 behaves as a voltage-gated outwardly rectifying channel, since it can be activated, in the absence of any agonist, by depolarizing voltages (> +60 mV) . One striking feature of TRPV1 is that the receptor can be sensitized and desensitized. This fact suggests that the TRPV1 function is subject to extensive modulation, which has significant implications for the involvement of TRPV1 in physiological and pathophysiological conditions. Some inflammatory mediators in damaged tissues including growth factors, neurotransmitters, peptides or small proteins, lipids, chemokines and cytokines sensitize TRPV1 to its agonists . Even in concentrations that fail to activate a current, CAPS can sensitize TRPV1 channels to protons and heat. Similarly, protons can sensitize TRPV1 channels to CAPS and heat [78, 79]. The elevation of temperature or local acidity can in principle augment the efficacies of partial agonists, transforming them from weakly or non-pain-producing ligands into noxious chemicals [80, 81]. Whereas protons sensitize TRPV1 directly, most of the mediators work through receptor pathways, which include receptor tyrosine kinases and G-protein-coupled receptors. It has been reported that phosphorylation by protein kinase A (PKA) [82–84] and protein kinase C (PKC) can sensitize TRPV1 to CAPS, protons or heat [47, 78, 85–88]. The phosphorylation of TRPV1 by PKC acts to potentiate CAPS- or proton-evoked responses and reduces the temperature threshold for TRPV1 activation. Others have suggested that isoforms of PKCα  or PKCμ  are responsible for the effects described above. Protein kinase D/PKCμ is a member of the protein kinase D serine/threonine kinase family that exhibits structural, enzymological and regulatory features distinct from those of the PKCs, with which they are related. TRPV1 can also be phosphorylated by Ca2+ CaM-dependent kinase II (CaMKII) , or Src kinase , whilst the phosphatase calcineurin produces desensitization of the TRPV1 receptor . TRPV1 undergoes two types of desensitization on activation by CAPS or protons: acute (short-term) desensitization and tachyphylaxis or loss of sensitivity to repeated stimulations [14, 94]. Physiologically, TRPV1 desensitization can lead to the adaptation of peripheral neurones to pain perception. The regulatory lipid PIP2 is a putative intracellular modulator of TRPV1, although there is some debate as to whether it sensitizes or desensitizes the channel. Mutations in a C-terminal cytosolic region of TRPV1 indicate an inhibitory role for PIP2 . However, others have found that PIP2 sensitizes TRPV1 and that depletion leads to desensitization [14, 96–99]. Another important membrane lipid in terms of TRPV1 activity is cholesterol. Cholesterol is a major component of plasma membranes and is enriched in lipid rafts. It has been shown to modify the function of many classes of ion channels . Cholesterol can modify channel activity indirectly by altering physical properties of the surrounding lipid bilayer, and the highly ordered lipid rafts can serve as organizing centres for many signalling processes . In recent years compelling evidence has emerged of a specific interaction between cholesterol and several channels [100–103]. A supporting role of sphingomyelin and gangliosides was also demonstrated . Sántha et al. demonstrated that inhibition of neuronal ganglioside synthesis by inhibition of glucosylceramide synthase reversibly decreased the CAPS-induced activation and TRPV1 expression of cultured dorsal root ganglion neurons, apparently leaving other markers of nociceptive neurons, such as CGRP and IB4, unaffected . Intracellular ATP can also sensitize TRPV1. TRPV1 binds and is modulated by Ca2+/CaM, a ubiquitous Ca2+ sensor [106, 107]. An increase in intracellular Ca2+ concentration causes TRPV1 desensitization, and CaM plays a role in mediating this effect [106–108]. CaM interacts in vitro with isolated peptides from the TRPV1 N-terminal region in a Ca2+-dependent manner , and also binds to the TRPV1 C-terminal region in a Ca2+-independent manner . The response of TRPV1 to heat can be modified by tyrosine kinases or G-protein-coupled receptors. Channel activation can occur even at normal body temperatures [78, 109, 110]. Reducing agents such as dithiothreitol (DTT) strongly increase the thermally induced activity of the TRPV1 channel . Moreover, the oxidizing agents diamide and chloramine-T also facilitate thermally induced TRPV1-mediated currents . Alkylating agents, such as N-ethylmaleimide also strongly and irreversibly affect heat-evoked responses from TRPV1, lowering the thermal activation threshold in a DTT-dependent manner . It follows from these data that TRPV1 is targeted by redox-active substances that directly modulate the channel activity, and that channel potentiation may occur under altered redox states in a tissue, e.g., during ischaemia and/or inflammation, presumably leading to hyperalgesia. Inflammatory agents such as bradykinin, serotonin, histamine, or prostaglandins can further stimulate TRPV1 activity, either by PKC-dependent pathways [110, 113, 114], by releasing the channel from PIP2-dependent inhibition [99, 115], by a PKA-mediated recovery from inactivation [116,], or by the formation of 12-HPETE [78, 117]. The role of the TRP channels in pain and neurogenic inflammation have been very well covered by previous authors (e.g. [118–121]) reflecting the enormity of the role that these channels play in sensory nerve function at both a central and peripheral level . Thus TRPV1 plays a key role in the development of the burning pain sensation associated with acute exposure to heat or CAPS, and with inflammation in peripheral tissues [28, 91]. The receptor seems to play important role in certain chronic pain conditions, such as neuropathic pain, osteoarthritis, bone cancer pain, inflammatory bowel disease and migraine [9, 123, 124]. Its role in the central nervous system (CNS) is known to involve pain processing and modulation, neurogenesis  and thermoregulation , amongst others, but is currently less well understood. Jancsó and Wollemann  have reported that CAPS stimulates adenylate cyclase activity in the rat cerebral cortex in vitro. Furthermore, direct injection of CAPS into the preoptic area of the anterior hypothalamus  or i.c.v. region  of the rat brain causes hypothermia, suggesting a role for this channel in thermoregulation. Similarly, systemic administration of TRPV1 antagonists such as AMG517 , AMG0347  and A-425619  causes an increase in body temperature within approximately 1 h of treatment . However, antagonist-induced hyperthermia may not be mediated by hypothalamic TRPV1 as peripherally-restricted antagonists still have the capacity to cause an increase in body temperature . Within the periphery, recent evidence has located TRPV1 on a variety of non-neuronal tissues (for more details see Table two in the paper of Fernandes et al. ). Although TRPV1 channel expression has been shown in a wide variety of tissues, evidence of functionality has not yet been demonstrated for all of these. One of the first cell types in which functionality was first identified is epidermal keratinocytes. Inoue et al. demonstrated that both CAPS and acidification produced elevations in the intracellular calcium concentration in cultured human epidermal keratinocytes that could be inhibited by the TRPV1 antagonist, CapZ . Similarly, treatment of human skin fibroblasts with CAPS induced significant changes in the membrane current and the intracellular calcium level that were antagonized by CapZ . It is therefore clear that TRPV1 is expressed and functional away from sensory nerves. Physiological or pathophysiological effects of non-neuronal TRPV1 have been implicated in inflammation, infection and immunity, the cardiovascular system and in conditions such as obesity . A physiological/pathophysiological role for non-neuronal TRPV1 is perhaps nowhere more apparent than in the case of inflammation, infection and immunity. Although the effects of these TRPV1 channels are non-neuronal, it is evident that they may well impact indirectly upon pain and/or neurogenic inflammation . Keratinocytes functionally express TRPV1. These cells play an important role in maintaining the integrity of the immune response in skin as well as stimulating cutaneous inflammation via prostanoid and cytokine release . TRPV1 activation by CAPS causes an increase in COX2 expression in human keratinocytes with a concomitant increase in PGE2 levels in vitro. An increase in IL-8 is also observed  Stimulation of inflammatory mediator release by TRPV1 agonists from keratinocytes could well have a significant effect upon sensory nerves that have a high density in skin . However, there is accumulating evidence that TRPV1 has functional roles away from sensory nerve activity . As well as keratinocytes, peripheral blood mononuclear cells (PBMCs) are also directly affected by TRPV1 activation. For example, PBMCs undergo apoptosis when stimulated with CAPS or RTX, an effect that is reversed by the TRPV1 antagonist, AM630 . There are various other cells involved in immunity that respond to TRPV1 and TRPA1 activation including bone marrow-derived dendritic cells, where CAPS leads to dendritic cell maturation and an increase in antigen presentation . TRPV1 is expressed, functional and active within cells relevant to inflammation, infection and immunity. It is clear from the studies that TRPV1 at least plays a paradoxical role in inflammation in vivo, for example, exacerbating inflammation in arthritis and yet in experimentally induced sepsis, TRPV1 null mice demonstrate elevated levels of pathological markers in comparison with wild type mice . It cannot be ruled out that this is due to differing effects of neuronal and non-neuronal TRPV1 channels . TRPV1 have been shown to control vascular responses either by the well-established neurogenic response that is mediated by sensory nerves  or via a direct effect on vascular tissue [139, 140]. However, the non-neuronal mechanisms involved in mediating vasodilatation and oedema formation following TRPV1 activation in vivo are unclear. TRPV1 on endothelial cells has been shown to regulate the expression and secretion of endothelial cell-derived CGRP, which affords protective effects on endothelial cells . Furthermore, CGRP is a potent vasodilator , and this CGRP may therefore impact upon blood pressure. Indeed, TRPV1 activation on sensory nerves also causes CGRP release, leading to a profound decrease in vascular tone . On the other hand, TRPV1 expressed on vascular smooth muscle appears to cause vasoconstriction [140, 144, 145]. It has also been suggested that CAPS has biphasic effects on the vasculature: at lower concentrations, CAPS (up to 10 nM) evokes vasodilation in skin due to sensory nerve activation, whereas higher concentrations (0.1–1 mM) elicit substantial constrictions in skeletal muscle arterioles due to non-neuronal TRPV1 stimulation . It is unclear whether this difference is due to receptor sensitivity or a difference in TRPV1 receptor density in the two tissues. A similar biphasic effect of CAPS has been demonstrated also in meningeal blood vessels . TRPV1 may also play a role in vascular responses during chronic hypoxia where up-regulation of the TRPV1 gene and protein is observed . Chronic hypoxia has been shown to enhance the ability of human pulmonary artery smooth muscle cells to proliferate and to increase resting levels of cytosolic calcium and capacitative calcium entry with both effects being inhibited in a dose-dependent manner by the TRPV1 antagonist, CapZ . These results suggest that TRPV1 on smooth muscle may be a critical pathway or mediator in chronic hypoxia-induced vascular changes . Obesity is one of the most significant health issues in western society due to the morbidity associated with this condition that is increasing in prevalence. Obesity is induced by the hypertrophy of adipocytes and the recruitment of new adipocytes from precursor cells. These processes are dependent on the regulation of adipocyte differentiation. CAPS has been shown to inhibit adipocyte differentiation in vitro by activation of AMP-activated protein kinase . Furthermore, Hsu and Yen  have shown that treatment of preadipocytes with CAPS decreases the number of normal adipocytes and increases the number of early apoptotic and late apoptotic cells in a dose-dependent manner. Thus the overall effect of TRPV1 modulation in obesity is stark. Both animal  and human  data have indicated that the consumption of CAPS- or non-pungent capsiate-containing foods is correlated with a reduced incidence of obesity. Similarly, oral administration of CAPS alone also suppresses body fat accumulation in mice , and dietary CAPS can reduce obesity-induced insulin resistance and hepatic steatosis in mice fed a high fat diet [122, 152]. In recent years, a role for TRPV1 in thermoregulation has also been identified which may, at least in part, be due to changes in thermogenesis (for review, see [72, 153, 154]). For many years, CAPS has been known to cause a centrally mediated hypothermia in mice . In contrast, its intragastric administration enhances thermogenesis and heat diffusion . Similarly, the jejunal administration of non-pungent CAPS analogues was shown to increase energy expenditure via direct activation of TRPV1 located on intestinal extrinsic nerves . Interestingly, some TRPV1 antagonists cause hyperthermia, associated with increased thermogenesis  through a peripheral mechanism , whilst TRPV1 gene knock down does not affect body temperature in mice  and TRPV1 knockout mice exhibit a normal basal body temperature [122, 129]. TRPV1 in the alimentary tract has also been implicated in metabolism, hair growth regulation , and the development of cancer . Consequently, control of the TRPV1 function may have the potential to provide exciting opportunities for therapeutic interventions. Its known functions in both health and disease have been continuously expanding promoting a better understanding of TRPV1. TRPV1 channels are mainly expressed on primary sensory neurones. They have been detected in key areas of the pain transduction pathway: on terminals of small- to medium-diameter nociceptors, such as peptidergic and non-peptidergic C fibres, some Aδ fibres [28, 79]; in skin nerve endings, DRGs, nodose ganglia, trigeminal ganglia of the peripheral nervous system, as well as laminae I and II  of the dorsal horn of the spinal chord. Projections may also extend into laminae V and X . Moreover TRPV1 has been found in different brain regions, such as in dopaminergic neurones of the substantia nigra, hippocampal pyramidal neurones, hypothalamic neurones, neurones in the locus coeruleus, and in various layers of the cortex [25, 160, 161]. The channel is present to a lesser extent in the hippocampus, cortex, olfactory bulb and cerebellum in the CNS [44, 162]. However, more recently, the use of TRPV1 reporter mice has revolutionized the study of TRPV1 expression, and they would suggest that the expression of this receptor is minimal within a few discrete brain regions, most obviously in the vicinity of the caudal hypothalamus [122, 145]. TRPV1 is additionally expressed in discrete spots in the plasma membrane and cytosol of different non-neuronal cells such as the endothelium, immune cells (lymphocytes, dendritic cells and mast cells), keratinocytes, smooth muscle cells and urothelium, thymocytes and macrophages, some of which are known to be involved in inflammation . An increased level of TRPV1 expression has been demonstrated in the sensory fibres of patients with an inflamed oesophagus (gastro-oesophageal reflex disease) or an inflamed bowel (both ulcerative colitis and Crohn’s disease), or with chronic breast tenderness and pain . There is likewise an increased TRPV1 expression in the sensory fibres of patients with rectal hypersensitivity and faecal urgency, and this increase is directly correlated with the degree of thermal and mechanical sensitivity . Emerging data of TRP channel research has elucidated roles for TRP channels in diverse therapeutic areas, and resulted in the identification of numerous potential drug targets beyond TRPV1. Success in finding a viable therapy targeting the TRPV1 channel depends on experimental studies aimed at obtaining detailed knowledge of the channel protein. TRPV1 pharmacology has relied heavily upon information derived from studies of site-directed mutants of the recombinant channel(s) by the identification of the most appropriate acting sites for potential drug candidates. Figure 1 indicates the mutated residues and the functional changes evoked by them, and also depicts the most important structural properties of TRPV1 (For high resolution figure, see Additional file 1). In order the easier comprehensibility and the more effective usability of the data, a comprehensive table summarizes the information of the mutants at the end of the article (see Table 1). Its mutation caused gain of function and strong toxicity when expressed in Saccharomyces cerevisiae. Its mutation caused gain of function mutation and weaker toxicity when expressed in Saccharomyces cerevisiae. Its deletion or mutation abrogated vanilloid and proton activation and RTX binding, without effecting heat activation. Its mutation abrogated vanilloid activation and RTX binding, without effecting heat activation. The residue is phosphorylated by PKA and is involved in desensitization. It is also functional target for PKCμ. Its mutation abolished phosphorylation by PKCμ and enhanced the channel response to CAPS by PKCμ. Its phosphorylation by PKA causes sensitization of heat-evoked responses. Its mutation caused impaired TRPV1-ARD interaction with ATP, and impaired tachyphylaxis, even in the absence of ATP. The mutant channel did not interact with CaM, and was slightly more sensitive to CAPS than the wild type. Its mutation resulted in a constitutively active channel, and caused gain of function mutation and weaker toxicity when expressed in Saccharomyces cerevisiae. The residue is covalently modified by allicin causing allicin activation of the channel. Its mutation resulted in a constitutively active channel, caused gain of function mutation and strong toxicity when expressed in Saccharomyces cerevisiae. Its mutation caused gain of function mutation and weaker toxicity when expressed in Saccharomyces cerevisiae. Its mutation resulted in significant response to pH 6.4 (threshold concentration for proton-activation). Its mutation abolished the ATP-mediated upregulation of TRPV1. When both sites were mutated, Y199/Q202 impaired the TRPV1-ARD interaction with ATP and ATP-mediated tachyphylaxis. The mutated channel was slightly more sensitive to CAPS than the wild type. Mutant channels formed a weaker complex with CaM than wild type but it still had a 1:1 stoichiometric ratio. Phosphorylation of hTRPV1 Y200 (Y199 in rTRPV1) by Src kinase increases the surface expression of TRPV1 and accounts for rapid sensitizing actions of NGF. When mutated, Src-dependent, NGF-induced Tyr phosphorylation was completely abolished. Its mutation caused gain of function and weaker toxicity when expressed in Saccharomyces cerevisiae. Its mutation caused gain of function and strong/weak toxicity when expressed in Saccharomyces cerevisiae. Its mutation caused gain of function mutation and weaker toxicity when expressed in Saccharomyces cerevisiae. Its mutation also caused significant response to pH 6.4 (threshold concentration for proton-activation). The residue is phosphorylated by PKA. It is involved in desensitization of the channel, and in the sensitization of heat-evoked TRPV1 responses when phosphorylated by PKA. Mutation resulted in a rightward shift of the CAPS concentration of half-maximal activation. Mutation caused reduction in CAPS sensitivity. Its phosphorylation by PKC potentiates CAPS, proton, and thermal responses, and that by PKA sensitizes the heat-evoked responses. It is a CaMKII phosphorylation site. When associated with T704I, S502A was found to lose the ability to be activated by CAPS and to lose the ability of vanilloid binding. Its mutation reduced PMA enhancement of CAPS-evoked currents, but had no effect on direct activation by PMA. Its mutation abolished CAPS responses, and RTX binding yet leave activation by heat and protons intact. Its mutation abolished CAPS responses and RTX binding, yet left activation by heat and protons intact. It is involved in I-RTX binding. Its mutation ablated the vanilloid sensitivity. Its mutation ablated the vanilloid sensitivity, and affected proton responses. Its mutation ablated proton activation, but not the proton potentiation. Its mutation affected proton responses. The residue is involved in RTX binding, CAPS sensitivity, I-RTX sensitivity and proton sensitivity. It is involved in vanilloid binding. It is an important molecular determinant in vanilloid sensitivity. Participates in Caps and RTX binding. Its deletion reduced CAPS sensitivity of the channel. It is involved in CAPS potentiation of heat-induced currents and in the transduction of the CAPS-binding signal to the opening of the pore. It is also important in deactivation gating process, 2-APB activation and for voltage-dependent gating. It contributes to the voltage modulation of the CAPS-induced currents and the CAPS potentiation of the heat-induced currents. It is involved in the transduction of the CAPS-binding signal to the opening of the pore. It is also important in deactivation gating process and for 2-APB activation. Its mutation caused significant response to pH 6.4 (threshold concentration for proton-activation). Its mutation caused gain of function of the channel and weaker toxicity when expressed in Saccharomyces cerevisiae. Its mutation caused gain of function of the channel and strong toxicity when expressed in Saccharomyces cerevisiae. The residue is involved in the voltage gating of the channel. The residue contributes to the voltage modulation of the CAPS-induced currents and the CAPS potentiation of the heat-induced currents. It is involved in the transduction of the CAPS-binding signal to the opening of the pore and in the 2-APB activation of the channel. It is also a relevant heat-sensing factor. The residue is a specific binding site for 2-APB. It is involved in voltage sensing and in TRPV1-lipid interactions. The residue is involved in voltage sensing and in TRPV1-lipid interactions. The residue is involved in the voltage-dependent gating of TRPV1, and contributes to the voltage modulation of the CAPS-induced currents and the CAPS potentiation of the heat-induced currents. It contributes to the transduction of the CAPS-binding signal to the opening of the pore. The residue contributes to the voltage modulation of the CAPS-induced currents and to the CAPS potentiation of heat-induced currents. It is involved in the voltage sensing and in TRPV1-lipid interactions. Its mutation decreased the cholesterol response of the channel. The residue contributes to the transduction of the CAPS-binding signal to the opening of the pore, and to the deactivation gating process. It is involved in voltage gating. Its mutation decreased the cholesterol response of the channel. Its mutation abolished the cholesterol response of the channel. Its mutation caused reduced DkTx responses. The residue is involved in the proton potentiation, but not in proton activation. Its mutation to neutral or positive residues potentiates responses to CAPS or heat, and introduction of a residue with lower pKa decreased the channel sensitivity to CAPS or heat. Its mutation reduced the proton-activated currents significantly, without altering the heat- or CAPS-evoked responses, and without eliminating the ability of protons to potentiate the responses to these stimuli. Its mutation caused gain of function of the channel and strong/weak toxicity when expressed in Saccharomyces cerevisiae. The residue is involved in DTT interaction. The residue is responsible for the extracellular modulation of TRPV1 by reducing agents. It is involved in DTT interaction. Its mutation and when associated with C616G and C634G significantly reduced DDT potentiation without having any effect on the CAPS, heat or voltage gating of the channel. Its mutation caused toxicity when expressed in Saccharomyces cerevisiae. The residue contributes to, but do not play a pivotal role in the proton activation. Its mutation enhanced the sensitivity to the acylpolyamine toxins AG489 and AG505. The residue plays essential roles in the heat response without affecting the CAPS responses or the desensitization of the channel. It is involved in proton-induced potentiation. Its mutation reduced the heat responses in amplitude and shifted them to higher temperatures, dramatically decreased the sensitivity to the acylpolyamine toxins AG489 and AG505 and caused toxicity when expressed in Saccharomyces cerevisiae. The residue contributes to, but do not play a pivotal role in the proton activation. Its mutation eliminated the proton-activated currents while leaving normal responses to CAPS and low pH potentiation. Its mutation exhibited a weaker response to heat in amplitude, however, the thermal activation threshold was unchanged. It is involved in DTT interaction, its mutation and when associated with C616G and C621G significantly reduced DDT potentiation without having any effect on the CAPS, heat or voltage gating of the channel. Its mutation also enhanced the sensitivity to the acylpolyamine toxins AG489 and AG505, and caused toxicity when expressed in Saccharomyces cerevisiae. The residue is a specific contributor to the CAPS response without affecting the proton or thermal sensitivity. Its mutation dramatically decreased the sensitivity to the acylpolyamine toxins AG489 and AG505. Its mutation enhanced the sensitivity to the acylpolyamine toxins AG489 and AG505. The residue is critical for heat activation. Its mutation was constitutively active, and caused strong toxicity when expressed in Saccharomyces cerevisiae. Its mutation also enhanced the sensitivity to heat and CAPS, and abolished the proton potentiation of the channel. This mutation affected gating rather than permeation properties of the channel. The residue is involved in acid activation and potentiation. Its mutant displayed large constitutive channel activation and caused toxicity when expressed in Saccharomyces cerevisiae. The residue is a specific contributor to the CAPS response without affecting the proton or thermal sensitivity, and it is engaged in inhibition by RuRed. Its mutation reduced the permeability of divalent cations and dramatically decreased the sensitivity to the acylpolyamine toxins AG489 and AG505. The residue is a specific contributor to the CAPS response without affecting the proton or thermal sensitivity. Its mutation reduced the proton-activated currents significantly, without altering the heat- or CAPS-evoked responses, and without eliminating the ability of protons to potentiate the responses to these stimuli. Its mutation caused reduced DkTx responses, and enhanced the sensitivity to the acylpolyamine toxins AG489 and AG505. The residue is involved in proton-induced potentiation. Its mutation caused large constitutive channel activation with abolished pH sensitivity. Its mutation caused toxicity when expressed in Saccharomyces cerevisiae. The residue is important in pH activation. Its mutation dramatically decreased the sensitivity to the acylpolyamine toxins AG489 and AG505. The residue plays essential roles in the heat response without affecting the CAPS responses or the desensitization of the channel. Its mutation reduced the heat responses in amplitude and shifted them to higher temperatures. Its mutation also caused gain of function and strong toxicity when expressed in Saccharomyces cerevisiae. The residue plays essential roles in the heat response without affecting the CAPS responses or the desensitization of the channel. Its mutation reduced the heat responses in amplitude and shifted them to higher temperatures. The residue is critical for DkTx binding, its mutation showed loss of DkTx sensitivity. The residue is involved in acid potentiation. Its mutation showed a potentiation effect under moderately acidic conditions. Its mutation also caused toxicity when expressed in Saccharomyces cerevisiae. The residue is involved in proton activation, and is a key integrator of voltage sensing, proton activation and potentiation. Its mutation caused lack of both voltage-dependent proton activation and potentiation, whereas activation by heat or CAPS was preserved. Its mutation caused reduced DkTx responses and caused toxicity when expressed in Saccharomyces cerevisiae. Its mutation resulted in non-functional channel. Its mutation reduced CAPS sensitivity, heat-induced current responses and heat-potentiated CAPS currents. The residue is involved in heat activation but not in CAPS activation, nor in the heat potentiation of the CAPS currents. The residue might contribute to allosteric coupling between temperature- and CAPS- dependent activation mechanisms. Its mutation affected the heat-induced current responses, lowered the CAPS EC50 value of the channel. Responses to CAPS were not potentiated by heat in the mutant containing channel, in fact CAPS-evoked responses were inhibited by heat. The residue is involved in the regulation of permeability of divalent cations, it gates the access of smaller cations. Its mutation caused gain of function and strong toxicity when expressed in Saccharomyces cerevisiae. Its mutation also reduced CAPS sensitivity, heat-induced current responses and heat-potentiated CAPS currents. Its mutation reduced CAPS sensitivity and heat-potentiated CAPS currents. Its mutation influenced the ability of CAPS and RTX to activate TRPV1 without changing the response of the channel to protons. Its mutation to Ala resulted in non-functional channel. Its mutation in a triple mutant (N676F/M677A/L678P) influenced the ability of CAPS and RTX to activate TRPV1 without changing the response of the channel to protons. Its mutation alone blunted heat-induced current responses without a significant change of CAPS- or heat-potentiated CAPS currents. Its mutation influenced the ability of CAPS and RTX to activate TRPV1 without changing the response of the channel to protons. Its mutation also blunted heat-induced current responses, with a leftward shift in the temperature threshold. Its mutation retained normal sensitivities to CAPS and heat, although it completely removed their mutual potentiation. The residue is involved in the regulation of permeability of divalent cations, it regulates the permeability of large cations. Its mutation caused impaired CAPS- and heat- activation, and significantly reduced their mutual potentiation. Its mutation caused gain of function and strong toxicity when expressed in Saccharomyces cerevisiae. Its mutation caused significant response to pH 6.4 (threshold concentration for proton-activation). The residue participates in PIP2 binding. The residue is a CaMKII phosphorylation site. PMA decreases the binding of [3H]RTX to TRPV1 through interaction with this residue. When associated with S502A, its mutation lost the ability to be activated by CAPS and lost the ability of vanilloid binding. The residue participates in PIP2 binding. Its mutation caused gain of function and strong toxicity when expressed in Saccharomyces cerevisiae. The residue has key roles in heat activation. Its deletion or mutation blocks RTX binding and proton- and CAPS-induced currents without affecting TRPV1 activation by heat. The residue has key roles in PIP2 binding. Its mutation caused gain of function mutation and weaker toxicity when expressed in Saccharomyces cerevisiae. Its mutation caused significant response to pH 6.4 (threshold concentration for proton-activation). Its mutation caused gain of function and strong/weaker toxicity when expressed in Saccharomyces cerevisiae. Its phosphorylation by PKC potentiates CAPS, acid, and thermal responses. Jordt et al. provided molecular evidence that the mutation of E600 caused enhanced sensitivity to CAPS . In the experiments by Jordt et al., replacement of Glu by Gln (E600Q) produced a greater than 10-fold leftward shift in the CAPS dose–response curve, with EC50 values of 520 and 40 nM for wild type and mutant receptors, respectively (Figure 1). Moreover, channels bearing a Lys at this position (E600K) exhibited even higher agonist sensitivity, showing saturated current responses at 50 nM CAPS. Introduction of neutral or positive residues at the E600 site potentiates responses to CAPS, whereas introduction of a residue with lower pKa (E600D) decreases the channel sensitivity to this stimulus . Welch et al. identified E636, D646 and E648 as specific contributors to the CAPS response without affecting the proton or thermal sensitivity. E636Q, D646N and E648Q had a threefold greater sensitivity to CAPS than the wild type TRPV1 channels . A triple mutant (N676F/M677A/L678P) was reported by Kuzhikandathil et al. to disrupt the ability of CAPS and RTX to activate TRPV1, while retaining the ability to respond to protons , suggesting that distinct amino acids that are close to or in TM6 control the gating in response to several modes of TRPV1 activation. Deletion of R114 and E761 in the N- and C-termini can block CAPS-induced currents without affecting TRPV1 activation by heat . F489Y resulted in a rightward shift of the CAPS concentration of half-maximal activation (EC50) . Jordt et al. conducted a search for residues involved in the action of CAPS on the basis of the differences between avian TRPV1 and mammalian (rat and human) orthologues , and found eight amino acids in the vicinity of TM3 that differ between the two forms, which may account for the species-specific sensitivity to CAPS (F507, Q519, F522, M523, S532, K535, E536 and T550 residues of rTRPV1 corresponding to I515, N527, L530, L531, C540, E543, L544 and A558 of chicken TRPV1, respectively). Exchange of any one of the Q519, F522, M523, S532, K535 or E536 residues for the chicken counterpart N, L, L, C, E or L, respectively, is sufficinet to ablate the vanilloid sensitivity of rTRPV1. They investigated the TM2-4 regions for sites involved in CAPS, RTX or proton action and observed that substitutions at two positions (R491G in TM2 and S512F in TM3) led to dramatic reductions in both proton- and CAPS-evoked currents. However, the introduction of other mutations at these positions (S512A, S512T or R491E) resulted in a greater preservation of functionality, and in each case a greater reduction in CAPS sensitivity was observed compared to extracellular protons. The mutant S512Y displayed little response to CAPS up to 100 μM, and no detectable specific binding of RTX. Nevertheless, the proton sensitivity was retained, as were the responses to noxious heat, albeit with a slightly higher thermal threshold (>48°C) and smaller maximal amplitudes compared to wild type receptors. An extended mutational analysis of the conserved residues adjacent to S512 (D509, S510, Y511, E513 and I514) revealed the most significant effects with the mutant Y511A. Despite lacking any significant CAPS sensitivity, this channel exhibited normal heat- and proton-evoked responses, with a thermal threshold and current amplitudes that were indistinguishable from those of the wild type receptor. In tests of whether the aromatic nature of the residue at position 511 is essential for ligand binding, substitution with a Phe (Y511F) was found to have only moderate effects, whereas substitution with a non-aromatic Cys (Y511C) again eliminated the CAPS sensitivity . Jung et al. identified two regions near Arg114 and Glu761 in the cytosolic tails of TRPV1 that determine ligand binding. Because the Arg114 and Glu761 residues are charged, it is likely that these charges are necessary for vanilloid binding. When positively charged Arg114 was replaced by a neutral amino acid, Ala, the mutant (R114A) elicited a CAPS-induced current comparable with that of the wild type TRPV1. However, when the Arg at 114 was replaced by negatively charged glutamate (R114E), a significant reduction in CAPS-induced current was observed with no apparent specific [3H]RTX binding. Because the adjacent amino acid, R115 is also positively charged, it was also replaced with Asp (R115D). The R115D mutant also abolished the CAPS-sensitive currents, indicating that charge at Arg-115 contributes equally to activation by CAPS. When the negatively charged Glu at 761 was changed to Gln, a neutral amino acid retaining a similar structure, the mutant (E761Q) elicited a great reduction in Icap (~98.0% reduction), and had no specific binding for [3H]RTX. Furthermore, when the Glu at 761 was substituted with positively charged Lys, the mutant (E761K) showed no current response to CAPS or ability to bind [3H]RTX. R114E and E761K elicited current responses to heat, but not to acid (pH 5.5). These results reflect the necessity of the negative charge of Glu at 761 for ligand recognition and the fact that the positive charge at R114 determines the ligand binding to the channel, but to a lesser extent than the charge at E761. Chou et al. showed the residue in position 547 to be a key contributor to RTX binding of TRPV1 by exchanging a single amino acid between the human and rat counterpart. Systematic replacement of the amino acids in the TM1 to TM4 domain of hTRPV1 with the corresponding rTRPV1 residues identified a single conservative substitution of Met for Leu (M547L) at position 547 that accounted for the species difference in RTX binding. The amino acid at this position also affected the potency of the antagonists I-RTX and capsazepine for inhibiting [3H]RTX binding and the agonist response to RTX. The M547A mutation in rTRPV1 reduced RTX affinity to the same degree as M547L (≈30-fold). A more radical mutation, M547Q, decreased potency to a smaller degree than either M547A or M547L. In the case of L547A and L547Q mutations in the hTRPV1 no [3H]RTX binding and little channel activity were detected even though protein was seen on western blots. The human L547M mutation has a higher affinity for RTX than wild type rTRPV1, and similarly the rat M547L displayed a lower affinity than wild type hTRPV1 . M547, W549 and T550 in the S4 segment participate in ligand interactions [171, 172]. F489 proved to take part in the CAPS activation of the channel , probably because of its close proximity to a domain containing mutations R491, Y511, and S512 shown to be implicated in CAPS sensitivity [168, 173]. When associated with T704I, S502A was found to lose the ability to be activated by CAPS and lose the ability of vanilloid binding [85, 91, 174]. Rabbit oTRPV1 can be activated by heat (45°C) and protons (pH 5), but it is 100-fold less sensitive to vanilloid activation than hTRPV1 or rTRPV1, and oTRPV1-transfected HEK293 cells did not exhibit any specific [3H]RTX binding. Gavva et al. constructed a rat-rabbit chimera of TRPV1 by the transfer of TM3 through 4 (S505-T550) from rTRPV1 to oTRPV1. The chimera displayed enhanced sensitivity to vanilloids, similarly to rTRPV1. Additionally, a human-rabbit chimera was created by transferring the S505-T550 from hTRPV1 to oTRPV1. The functional analysis again showed that this chimera also gained sensitivity to CAPS, further confirming that the TM3-4 region is responsible for vanilloid sensitivity. On the basis of the 10 differences found between rTRPV1 and oTRPV1 and the six between hTRPV1 and oTRPV1, Gavva et al. mutated the residues that in rabbit differ from those in both rTRPV1 and hTRPV1 (A505S, A520S, C534R, T540S and I550T). Changing the single residue at 550 in rabbit to the corresponding residue found in rTRPV1 and hTRPV1 (I550T) was sufficient to confer a gain of function for activation by CAPS. Changing the residues A505S, A520S, C534R and T540S individually or in various combinations did not cause any changes in the responses of oTRPV1 to vanilloids. For a better understanding of the biophysical requirements at position 550, Gavva et al. explored several polar and hydrophobic substitutions. A gain in CAPS sensitivity was observed when Ser was introduced instead of Thr (I550S), the small non-polar Ala (I550A) resulted in only a partial gain of CAPS sensitivity, while thiol group containing-residue Cys (I550C) resulted in a very small gain in oTRPV1 CAPS sensitivity. Introduction of Tyr (I550Y) with its bulky phenolic side-chain at this position resulted in a complete loss of TRPV1 response to vanilloid, proton or heat activation, although the expression level of this mutant remained comparable to the others. To verify further that the T550 found in native rTRPV1 hTRPV1 contributes to the vanilloid sensitivity of TRPV1, the effects of substitution of the natural Thr by the oTRPV1 Ile 550 (T550Y) residue were examined. 45Ca2+-uptake experiments revealed a 10-fold loss in sensitivity to CAPS of rTRPV1-T550I, and a 40-fold loss in sensitivity of hTRPV1-T550I. Gavva et al. confirmed the finding of Jordt and Julius that T511 is critical for vanilloid sensitivity. Both rTRPV1-Y511A and hTRPV1-Y511A had lower vanilloid sensitivity. They tested the CAPS sensitivity of the oTRPV1 double mutant containing I550T (gain of function) and Y511A (loss of function), i.e., oTRPV1-Y511A/I550T. Compared with oTRPV1-I550T, the reduction in CAPS sensitivity of oTRPV1-Y511A/I550T in the 45Ca2+ uptake assay was >100-fold. In fact, the magnitude of the loss in CAPS sensitivity by Y511A was greater than the gain seen in I550T. The T550I mutation resulted in the CAPS dose-response curve shifting 10-fold to the right, relative to the control, without reducing RTX sensitivity in the 45Ca2+ uptake assay. However, [3H]RTX specific binding was significantly reduced in rTRPV1-T550I-transfected cells. A series of single point mutations were introduced into oTRPV1 (M514I, A525V, T526S, H533Q and L547M) to mimic the residues in rTRPV1, which has been shown to display the highest RTX-binding affinity. Replacement of the oTRPV1 residues at M514I, A525V, T526S and H533Q individually did not alter the oTRPV1 response to CAPS or RTX. The single residue change L547M in oTRPV1 resulted in a selective gain of ~30-fold higher sensitivity to RTX with no apparent change in CAPS sensitivity in 45Ca2+-uptake assays. oTRPV1-L547M demonstrated greater sensitivity to RTX, but failed to show any measurable [3H]RTX binding, and it was therefore hypothesized that L547M contributes to RTX sensitivity, but requires additional residues such as T550 to attain the affinity needed for measurable [3H]RTX binding above the assay background. A reverse mutation in rTRPV1 (M547L) displayed similar responses to CAPS and RTX in the functional 45Ca2+-uptake assay. To test whether oTRPV1 might require both T550 and M547 to attain measurable [3H]RTX binding, the oTRPV1 L547M/I550T double mutant was constructed and its vanilloid sensitivity was examined in functional 45Ca2+-uptake and [3H]RTX binding assays. As predicted, oTRPV1-L547M/I550T exhibited strong [3H]RTX binding together with only a slight increase in functional sensitivity to CAPS and a somewhat greater increase for RTX. This demonstrates that Met547 and Thr550, as present in native rTRPV1, are required for measurable [3H]RTX binding in oTRPV1. oTRPV1-I550T and L547M/I550T resulted in slight changes in sensitivity to pH 5.5. Gavva et al. hypothesized that Y511, M547 and T550 may be present in the binding pocket and are important molecular determinants for vanilloid sensitivity . Johnson et al. investigated the role of two residues (S512 and M547) identified earlier to be responsible for major species-specific differences in vanilloid activity in the response of the channel to a variety of ligands. Their initial studies confirmed the clear species-specific differences in RTX potency described previously by Chou et al. . RTX activated wild type rTRPV1 with a fourfold higher potency than the wild type hTRPV1. Johnson et al. switched the residues at position 547 between the two receptor homologs creating the M547L rat mutant and the L547M human one. L547M produced a significantly more RTX-sensitive channel with the EC50 value comparable with that of the wild type rat receptor. Conversely, when the reverse mutation was made in the rat construct (M547L) a loss of function was observed, although, the change was not significant. The species-specific differences in CAPS sensitivity were also investigated. CAPS was found to be significantly more potent at the wild type hTRPV1 than at the wild type rTRPV1 channel. When the 547 residue was switched between the rat and the human constructs, the sensitivity to the agonist was again altered. In this instance, this mutation caused a significant decrease in potency in the human mutant (L547M) compared with the human wild type, with an EC50 value comparable with that of the wild type rTRPV1. As for RTX, when the reverse mutation was made in the rTRPV1 construct, there was no significant difference . Susankova et al. Ala-scanned the residues Y666-G683 containing the most conserved region of the TRP protein family. Three mutant channels (Y666A, I672A, N676A) showed no CAPS-evoked activity at all. These mutants were also pH insensitive, they were not activated in the absence of extracellular Ca2+, and they gave very small and nonspecific heat-induced membrane currents. Y666A and N676A possessing no any potentiated currents in response to 47°C and 30 μM CAPS applied together, proved to be non-functional mutants, suggesting that these two residues within the inner-pore region of rTRPV1 are critical for channel functionality. Co-application CAPS (30 μM) and heat stimuli (43°C) caused efficient potentiation in mutants I672A, L673A, L674A, L678A, and M682A which were functionally silent or only barely responded to CAPS at base temperature. Compared with wild type TRPV1 however, the current densities of the CAPS-induced responses measured at 47°C were significantly reduced in: I668A, I672A, L673A, L674A, L675A, and M682A. These mutations but L675, whose heat-activation was unaffected, caused also significantly impaired heat- and CAPS-activation. Y671A dramatically lowered the CAPS EC50 value in the experiments of Mohapatra et al. .
Susankova et al. further studied this mutant and reported that responses to CAPS were not potentiated by heat, but in contrast to the other mutants and the wild type channel, CAPS-evoked responses were consistently inhibited by heating above 30°C. Susankova et al. reasoned that the loss of potentiation in Y671A might be attributable to changes in agonist sensitivity. When the channels were desensitized by repeated applications of CAPS (1μM and/or 30μM), the heat-induced potentiation reappeared. Y761 might contribute to allosteric coupling between temperature- and CAPS- dependent activation mechanisms. Susankova et al. evaluated the changes in CAPS responsiveness evoked by Ala mutations by comparing their relative sensitivities at 1 and 30 μM CAPS at 47°C. An alternating pattern was found with unaltered sensitivity to CAPS in T670A, L675A, G683A, and wild type channels and a reduced but not abolished CAPS sensitivity in mutations I668A, Y671A, I672A, L673A, L678A, and M682A. Interestingly, the mutation of Leu 673 to Ile (L673I) in the experiments of Myers et al. however caused a channel with elevated basal activity and significant cytotoxicity. To further assess the maximal CAPS-induced responses in the mutants, Susankova et al. compared the inward currents measured at 47°C in the absence and presence of a high concentration of CAPS. Except for Y666A, N676A, and I679A, the inward currents were significantly greater in the presence of 30 μM CAPS than in its absence. The lack of mutual potentiation between the two stimuli in the former two mutants was caused by their insensitivity to CAPS. Notably, the mutation I679A retained normal sensitivities to both stimuli, although it completely removed their mutual potentiation at 47°C. In several residues (V667A, T670A, I672A, L673A and L675A), the degree of the CAPS-induced increase in the amplitude of the inward current at 47°C was clearly reduced, although these changes did not achieve statistical significance. Changes induced by individual mutations in the 1 μM versus 30 μM CAPS-induced current relationships measured at 47°C might reflect the changes either in CAPS sensitivity or in the allosteric linkage between CAPS and heat sensor movements and channel opening. Specifically, mutation I679A appeared to cause a decrease in the synergistic interaction of CAPS and heat with the TRPV1 channel. Susankova et al. denoted that the periodicity observed in the relationships between the maximal activation capacities obtained for 1 and 30 μM CAPS at 47°C supports the hypothesis that there exists a structural explanation for the gating of the TRPV1 channel by chemical stimuli. The pattern of sensitivity to CAPS (every three to four substitutions) is consistent with an α-helical structure contributing to CAPS-induced channel gating. Similar pattern of residues involved in the CAPS sensitivity can be observed in TM3 and TM3-TM4 linker region identified by Jordt and Julius . The repetitive patterns of CAPS sensitive residues apparent in both papers however seem to fit better for a 3.4 residues per turn of the helix than for a 3.6 one. This may further support the finding of Salazar et al. who reported that the TM6 of TRPV1 represent amphipathic helix with 3.4 residues per turn and a P(φ) value of 107° rather than α-helix with 3.6 residues per turn and a P(φ) value of 100°. Considering the above mentioned findings, all the TM helices of TRPV1 might be regarded to have the same structure . Boukalova et al. found that the E570Q mutation accelerated the rate of activation of the channel. In contrast, a significantly lower rate of activation was observed in mutated rTRPV1 channels containing mutations R557A, M581T, D576R, Q560H, R557K and E570R, indicating contribution of the transduction of the CAPS-binding signal to the opening of the pore. The estimated deactivation time (the time taken for the current to decrease to 50% of its level before removal of the CAPS) was markedly longer in R557K as compared with the wild type, but not in R557A or R557L, indicating that the specific side-chain properties of R557, and not only a positive charge at this residue, are important for the deactivation gating process. In R557A, R557K, Q560H and M581T, the second response to 1 μM CAPS reapplied after an apparent wash-out had a faster onset than in the wild type, suggesting an incomplete deactivation process. The time courses of the CAPS-induced whole-cell currents through R557A, R557L, E570R, D576R, R579A and R576R/R579D closely resembled those of wild type TRPV1. In contrast, R557E/E570R exhibited slower activation and deactivation kinetics. A significantly faster offset of CAPS-dependent responses was detected in E570A and R576R/R579E. The mutations causing similar defects in the voltage-dependence affected the chemical sensitivity of TRPV1 very differently . Mutation studies by Lee et al. and other groups, along with comparisons of TRPV1 variants from species sensitive or insensitive to vanilloids, have identified important residues for ligand binding, such as Tyr511, Met547 and Thr550[168, 170, 171]. Lee et al. generated a series of rTRPV1 mutants within the TM3 (Y511A, Y511F) and TM4 (M547L, T550A, T550I, T550S) regions, and performed docking studies with the prototypical agonists, CAPS and RTX, to assess their roles in ligand recognition. Their mutational studies based on the foregoing in silico docking experiments resulted in the discovery that the vanillyl moiety of CAPS oriented towards Y511, while the tail end extended towards M547. The vanillyl moiety formed π-π stacking and hydrophobic interactions with Y511, and H-bonding with S512. Moreover, the carbonyl group participated in H-bonding interactions with Y511 and L571. Mutation of Tyr in position 511 to Phe (Y511F) had only a slight effect on the activity of CAPS, but its mutation to Ala (Y511A) caused loss of the π-π stacking and H-bonding capabilities, leading to a sharp decrease in CAPS activity. The mutation of T550I also evoked a significant decrease in CAPS activity, but the influence of the change of Thr to Ala (T550A) or Ser (T550S) was much weaker. This may reflect the bulky side-chain of Ile disturbing the binding of the nonenyl tail of CAPS. Although the hydrophobic nonenyl tail was oriented towards the upper hydrophobic region of the binding site, it did not fully occupy the hydrophobic region of the two shallow hydrophobic areas composed of F543 and M547 because it is linear and too short to reach both areas. These data indicate the relevance of the overall size, shape and/or hydrophobicity of the lipophilic side chain region for binding. In the case of RTX, the vanillyl moiety appeared to form π-π stacking with Y511, as did that of CAPS. The importance of Y511 in RTX binding was also confirmed by their mutation study. When Tyr 511 was mutated to Phe (Y511F), the binding affinity of RTX decreased less than fourfold, as the π-π stacking and hydrophobic interactions of the vanillyl group of RTX were maintained. As compared with the relatively short and linear tail of CAPS, the C13-propenyl group of RTX contributed to the hydrophobic interaction with M547, and its importance in RTX binding was also justified by the mutation studies. When Met was mutated to Ile (M547I), the binding affinity of RTX decreased more than 11-fold. This may be caused by the greater ability of M547 than of Leu to extend to make the hydrophobic interaction with RTX. In addition, the C4-OH group of RTX seemed to fit well with the small side-chain of T550 in addition to H-bonding with the residue. This docking result is in agreement with the mutation data that neither mutated T550S nor T550A caused any binding loss relative to the wild type, while T550I led to a drastic decrease (over 20-fold) in RTX-binding affinity. As with CAPS binding, the bulky side-chain of Ile could cause steric interference with the binding of RTX. It was noticeable that the orthophenyl group of RTX underwent hydrophobic interaction with L515. The ultrapotency of RTX might be due to the fact that it could occupy the binding site fully, taking maximum advantage of the multiple possible binding interactions with TRPV1. Since RTX has phenyl rings in both the 4-hydroxy-3-methoxyphenyl and lipophilic side chain regions and there are hydrophobic residues at both ends of the binding site, RTX could flip over and achieve a minor binding mode. In this case, the vanillyl moiety would point towards M547 and participate in the hydrophobic interaction. Correspondingly, the orthophenyl group would orient towards Y511. The C20-ester seemed to take part in H-bonding interactions with N551 and the C13-propenyl group formed the hydrophobic interaction with L515. Boukalova et al. reported that the inward currents induced by 300 μM 2-APB were reduced in R557L, R557K, Q560H, E570Q and E570R and most strongly (>50-fold) in K571E, which was normal in all other aspects of TRPV1 activation (Figure 1). The TRPA1 channel, which is co-expressed in many of the same neurones as TRPV1, has been proposed to be the sole target for the actions of allicin [56, 181, 182]. However, other groups have reported that TRPV1 is also a target for the actions of this compound [57, 183–185]. The agonist action of allicin was confirmed by Salazar et al. , who further demonstrated that the allicin behaves as a TRPV1 agonist through the covalent modification of a single Cys localized in the N-terminus of the channel at position C157  (Figure 1). The heat activation pathway is largely unknown, although the outer pore region, including the turret and the selectivity filter-to-S6 linker, is clearly part of the protein structure participating in the heat-induced conformational rearrangement. Intensive studies of thermo TRP channels have so far indicated numerous channel regions that contribute to temperature-dependent activation. Exchanging the intracellular C-termini between TRPV1 and the cold-activated TRPM8 channel was found to switch their sensitivity to heat . This result is consistent with the earlier observation that deletion of the last 72 amino acids of the TRPV1 C-terminus influenced channel activation (though in a modality-independent manner) . Furthermore, the intracellular segment between ANK and TM1 was recently proposed to serve as the thermal sensor for TRPV1 [189, 190]. Introduction of neutral or positive residues at the E600 site (E600Q and E600K) potentiated the responses to heat, whereas the introduction of a residue with lower pKa (E600D) decreased the channel sensitivity to it  (Figure 1). Susankova et al. performed Ala-scanning of the residues Y666-G683. The mutations I668A, L669A, Y671A, I672A, L673A, L674A, M677A, L678A and M682A blunted the heat-induced current responses. To obtain a more complete picture of how the individual mutations affect the heat sensitivity of the TRPV1 channel and to further characterize the specificity of their temperature-induced responses, the temperature threshold for activation and the temperature coefficient (Q10) from the Arrhenius plots of individual current–temperature relationships were quantified. The most frequently observed phenotype was a leftward shift in the temperature threshold (V667A, I668A, L669A, L673A, L674A, M677A, L678A and M682A). Seven mutations (T670A, Y671A, I672A, L675A, I679A, L681A and G683A) had thermal thresholds no different from wild type TRPV1. Except for the T670A, L681A, and G683A, the mutations strongly reduced Q10 in all mutants tested. Susankova et al. claimed that average temperature-dependent activation profile with the five peaks separated by four troughs at residues I672-L674, N676, L678, and M682 might correspond an α-helical structure, which most likely represents the inner-pore region of the TRPV1 channel. The results of Susankova et al. also provide functional support for the role of the putative inner-pore region in controlling the gating of the vanilloid receptor TRPV1 channel. L669A and M677A are significantly less sensitive to heat without a significant change of CAPS- or heat-potentiated CAPS currents suggesting that these residues are involved in heat activation of the channel, but not in potentiation by heat. L678A displayed a reduced sensitivity to heat and CAPS with an unaffected heat-potentiated current, suggesting a role of L678 in the process of CAPS- and heat- activation, but not in the potentiation mechanism. This finding somewhat contradicts to the results of Kuzhikandathil et al. who demonstrated M677 to affect the ability of CAPS and RTX to activate TRPV1 without changing the channel's response to protons however working on a triple mutant (N676F/M677A/L678P) containing channel . By generating a chimera between the TRPV1 and TRPM8 channels, in which the region V686 to W752 of TRPV1 was replaced by the same C-terminal region of TRPM8 (V982 to W1055), Brauchi et al. identified TRPV1 C-terminal amino acids Q727 and W752 as being the minimum portion able to turn TRPM8 into a heat receptor. The mutations N628K, N652T and Y653T resulted in TRPV1 channels responding normally to CAPS and pH, but whose heat responses were reduced in amplitude and shifted to higher temperatures. Moreover, the time course of activation of these single point mutants was identical or very similar as compared with wild type TRPV1, suggesting that the desensitization was not strongly altered . A double mutant N652T/Y653T and a triple mutant N628K/N652T/Y653T yielded receptors with CAPS, 2APB and pH EC50 values and maximal responses that were indistinguishable from that of wild type TRPV1, but with a further reduction in temperature responses . The triple mutant (N628K/N652T/Y653T) exhibited altered heat-gating kinetics. Whilst the unitary conductance of the wild type TRPV1 and the triple mutant channel was identical, the triple mutant possessed channel openings of only short (<1 ms) durations, and the longer (~10 ms) ones proved to be completely absent. The triple mutant, however, is normally gated by CAPS . The T633A mutant exhibited a weaker response to heat, reaching ~32% of the 1 μM CAPS current. In contrast with the change in peak activity, however, the thermal activation threshold coincided with that of the wild type (~42°C) . A less severe perturbation to the turret region of the TRPV1 channel by deletion of its first 10 amino acids ( Δ G603-S612) substantially and specifically affected the heat activation but not CAPS activation of the channel . A significantly higher threshold for heat activation was detected by Boukalova et al. for E570A. The Y554F, Y555F, Q561H, E570Q, E570R, K571E, R575A and R579D mutations left the threshold for heat activation unchanged. Jordt et al. demonstrated that E600 serves as a fundamental regulatory site for the proton potentiation of vanilloid receptor activity over a physiologically relevant range (pH 6–8), but not in proton or heat activation. The E600Q mutants retained the ability to be activated by acidic conditions or heat, but differed from the wild type receptor in two significant ways (Figure 1). First, upon heat activation the initial heat stimulus produced a relatively large peak current response that was much closer to the final plateau value than that typically observed with wild type channels. Second, bath acidification failed to potentiate peak currents beyond this steady-state value. Similar results were obtained with oocytes expressing the E600A and E600S mutants. The pH dependence of thermal activation was related to the side-chain charge of the residue at position 600: heat-evoked currents in the E600D mutant were potentiated only when the bath pH dropped below 6.5. The E600H mutants, on the other hand, showed continuous potentiation over the entire pH range tested (9.0 to 5.0), but the extent of potentiation was significantly less than that observed for wild type or E600D channels. For E600Q or other mutants having non-titratable amino acids at this position, the magnitude of the heat-evoked currents was largely independent of the extracellular pH. The D601N and E648Q mutants exhibited a phenotype characterized by reduced proton-evoked responses, with normal CAPS sensitivity. The E648A mutants demonstrated an even greater decrease in proton-activated current amplitudes, whereas the CAPS- or heat-evoked currents did not differ significantly from those of wild type or E648Q channels . This finding is in direct contradiction to the one made by Welch et al., who identified E648 as specific contributor to the CAPS response without affecting the proton or thermal sensitivity . E458Q, D471N, E478Q, E536Q, H614Q, E636Q, D646N, E651Q and D654N mutations were also tested by Jordt et al. , but no phenotype was reported in terms of acid activation or potentiation.) E600V caused the complete and specific loss of pH sensitivity . Deletion of R114 was found by Jung et al. to abolish the sensitivity to acid. When the positively charged Arg at 114 was replaced by a neutral amino acid, Ala, the mutant (R114A) elicited an Icap comparable with that of the wild type TRPV1. However, when the Arg at 114 was replaced by negatively charged Glu (R114E), a significant reduction (~97% reduction) in Icap was observed with no apparent specific [3H]RTX binding. Sutton et al. reported that the S512Y mutant caused a small but significant decrease in the ability of protons to gate the TRPV1 channel . A mutation of hTRPV1-L547M by Johnson et al. caused a decrease in the potency of protons, but no increase was seen when the reverse switch was made in the rat receptor (M547L). E651 was found to be important for pH activation . Substitution of the residue T633 by Ala abrogated low pH-activated currents, but the T633A mutant exhibited normal CAPS responses, including rapid activation kinetics and large steady-state currents. Furthermore, the potentiation by low pH was also retained, despite the loss of the low pH sensitivity for direct activation. Conserved residues on the N-terminal end of the pore helix were also mutated by Ryu et al., i.e., Y627A and S629A. Both mutants were functional and produced relatively normal responses to CAPS when applied either alone or in combination with mildly acidic pH. The mutants were also activated by low pH directly, albeit with a slightly smaller maximal current than their wild type counterparts. The data suggest that these residues may contribute to, but do not play a pivotal role in the proton activation of TRPV1 as T633 does . In the wild type counterpart, pH 5.5 evoked long bursts of activity, in which the openings were separated by brief closures. The T633A mutant instead showed rare spike-like openings. The mutation drastically slowed the opening rate at low pH. The significant shortening of the open time suggests that the mutation destabilizes the open conformation of the channel. T633 was systematically mutated to others, including Y, R, Q, N, L, K, E, D, V, S and A, which span both polarity and size. Substitutions with polar residues such as Q, N and Y or the charged residues R, K, E and D all resulted in non-functional channels. The T633S mutation was functional, but with a significant reduction in low pH current and a slow activation by CAPS. However, the T633V mutation preserved the wild type responses in all aspects. On substitution with Leu, containing a larger hydrophobic side-chain, the channel became non-functional. Together, these results suggested that T633 is involved in functional interactions in a compact hydrophobic environment. The size of the side-chain at this position is crucial. Replacing Thr by Ala, a smaller side-chain, was able to preserve the CAPS response while abrogating the low pH activation; a larger side-chain substitution at this position, on the other hand, became deleterious . The K535E, E536W, V538L and A539P residues were clustered around the centre of the loop, and the mutations appeared to impact predominantly the proton responses. V538L resulted in no detectable current at pH 5.5, while retaining >93% of the wild type peak CAPS response. The CAPS response of E536W was also reduced; however, this mutation, as with K535E and A539P, involved substantial changes in the side-chain property. Such substitutions could produce non-local perturbations on the channel structure and consequently non-specific phenotype changes. A common feature of all these mutations is the significant, consistent reduction of the low pH current, suggesting that the region plays an important role in proton activation. S532M, Q533E, S540L and M541L exerted little effect on either CAPS or low pH responses. The CAPS activation and its potentiation by low pH were not altered by the V538L, E536W, K535E or A539P mutations at the macroscopic level. V538L displayed a marked (>90% suppression) reduction in the maximal activity elicited by pH 4.5. Also unlike T633A, which exhibited no measurable pH current over the entire pH range, V538L furnished a titration curve with a consistently increasing trend as the pH was lowered. It appears that the mutation weakened, but did not disrupt the pH gating completely. The V538L mutant also exhibited a robust heat response. The function of the channel appeared to be quite sensitive to perturbations at position 538 (V538L, V538A, V538G, V538I, V538T). Even the relatively conservative substitution with Ala abrogated the low pH currents and also reduced the CAPS activity. Further reduction of the size of the side-chain with a substitution by Gly resulted in non-functional channels . In the experiments by Myers et al. , wild type TRPV1 responded strongly to CAPS but displayed negligible current under basal conditions or in response to pH 6.4, which is at the threshold concentration required for proton-evoked activation at room temperature. In contrast, eight mutants (H166R, I352N, I352T, Q560R, M562D, E684G, E684V, L792P), displayed a significant response to pH 6.4, although no basal current was detected at pH 7.4 Mammalian cell patch-clamp experiments by Myers et al. demonstrated that F640L displayed a strong basal channel activity and substantial toxicity when expressed in HEK293 cells. Whereas the wild type channel was potentiated by exposure to pH 6.2, the F640L current was completely unaffected under these conditions. Addition of CAPS to F640L-expressing cells led to a marked increase in current, demonstrating that F640L channels are not maximally open in the basal state. Higher doses of protons could activate the mutant channel illustrating that while the mutant has lost the ability to be potentiated within a certain pH range, its proton activation has not been completely ablated. Weakly alkaline solution (pH 8.2) failed to reduce the F640L-mediated basal current. N628D and V658A showed a potentiation effect under moderately acidic conditions. Furthermore T641S and T650S mutants displayed large constitutive channel activation with relative insensitivity to pH 6.4 . Wang et al. reported that the first four TMs (TM1-4) of TRPV1 dictate whether the activity of a fully CAPS-bound receptor can be further enhanced by protons, and a glutamate residue (E536) in the linker between TM3 and TM4 of hTRPV1 is critical in the modulation by protons and in the further stimulation of fully liganded TRPV1 [75, 194]. Aneiros et al. replaced amino acid F660 in hTRPV1 (corresponding to F659 in rTRPV1) with a variety of different amino acids (A, C, E, H, I, K, L, S, T, V, W, Y) to determine the side-chain contribution to the proton activation of TRPV1. Proton activation was ablated by all amino acid replacements with the exceptions of F660Y and F660W, the two alternative non-basic aromatic amino acids besides Phe. Replacing Phe with His (F660H), which contains a basic aromatic ring (imidazole), or non-aromatic amino acids caused complete loss of proton activation. However, F660Y demonstrated a reduced sensitivity to proton activation as compared with wild type TRPV1. Although less pronounced, the maximum effect values at 1 μM CAPS were also reduced relative to the wild type, while the CAPS EC50 values at pH 7.4 were comparable. Ca2+ flux and whole-cell patch-clamp experiments using HEK293 cells transiently expressing TRPV1 mutants or wild type TRPV1 demonstrated a complete lack of activation of the mutant F660S by protons. In contrast, F660S maintained responsiveness to CAPS. TRPV1 mutant F660S ablated proton activation, but not CAPS or heat activation. F660A neither significantly inhibited nor significantly potentiated CAPS responses in the presence of protons. F660W showed a reduction in sensitivity to proton activation as well as CAPS activation similarly to F660Y. These data suggest that a non-basic aromatic amino acid at position 660 is essential for proton activation. A non-aromatic amino acid or His at position 660 seems to be tolerated for the channel to be functional in the CAPS activation mode; a non-basic aromatic side-chain, however, appears to be required to maintain activation by protons. The loss of activation by protons when F660 is replaced with a charged amino acid and the absence of a titration phenotype suggest that Phe is critical for the transduction of proton-mediated gating rather than voltage or proton sensing. Aneiros et al. concluded that the proton activation and potentiation of TRPV1 are both voltage-dependent and that amino acid 660 is the key residue regulating the proton-mediated gating of hTRPV1 . Susankova et al. also checked the Ala-scaned region of Y666-G683 for mutants disturbing the voltage sensor function of the channel. To compare the effects of mutations on voltage-dependent activation, Susankova et al. used a voltage step protocol from −140 to +140 mV (increment, +20 mV) at 25°C and normalized the resulting current–voltage relationships at +60 mV for each cell. Except for the T670A, Y671A and M677A, the Ala mutations led to a rightward shift of the activation curve and a concomitant decrease in the equivalent charge z, reflecting a decrease in channel activity at more negative holding potentials (Figure 1). These data indicate that most of the Ala mutations modulate the gating of the TRPV1 by shifting the voltage dependence toward more positive membrane potentials. Temperature- and voltage-dependent mechanisms underlying the TRPV1 channel activation do not need to be strictly coupled . Voets et al. demonstrated the roles of K571, R575 and R579 in voltage sensing using charge-neutralizing mutations in TM4 and the TM4-TM5 linker of human TRPM8 [172, 196]. In the experiments of Boukalova et al. , the half-maximal activation voltage (V1/2) of wild type TRPV1 was 154 ± 4 mV, and V1/2 was shifted towards less depolarizing voltages for R557K (97.1 ± 4 mV), G563S (78 ± 2 mV), and M581T (122 ± 11 mV). Mutations Y554A, Y555S, E570L, R557E and R579E led to a complete loss of function, but three charge-swapping double mutants (R557E/E570R, D576R/R579E and D576R/R579D) exhibited measurable voltage-dependent activity, indicating a partial recovery of the functionality of the R557E and R579E mutant channels. To reveal the voltage-independent component of TRPV1 gating, Boukalova et al. quantified V1/2 and the percentage of the voltage-independent component of gating from currents obtained in the presence of 10 μM CAPS. Significant changes in the apparent gating valence were detected in E570R and D576R/R579D, indicating that the S4-S5 linker may increase its contribution to voltage sensing when CAPS is present. R557A, R557L, D576N and D576R, which were only weakly voltage-dependent under control conditions, became as voltage-sensitive as wild type TRPV1 in the presence of CAPS, suggesting a preserved or even increased allosteric effect between these two stimuli. Relative to wild type TRPV1, the percentage of the voltage-independent component of CAPS-induced gating was found to be strongly reduced in R557A, R557L, E570A, R579A, R579D, R557E/E570R and D576R/R579E. In contrast, this component was predominant in E570Q and E570R. G563S possesses an enhanced voltage-dependent activity; inward currents induced by 1 μM CAPS exhibited slow activation kinetics and an incomplete deactivation that was fully blocked by 1 μM RuRed. G563S was not responsive to a temperature ramp (from 25°C to 48°C) and was only weakly sensitive to 300 μM 2-APB. These data suggest that the mutation G563S stabilizes the open conformation of the channel and thus G563 in TRPV1 could play an analogous role in channel gating as in TRPV3 . The F660S mutant in hTRPV1 (corresponding to F659S in rTRPV1) was shown by Aneiros et al. to lack both voltage-dependent proton activation and potentiation, whereas activation by heat or CAPS was preserved [194, 195]. S512 and M547 were tested by Johnson et al. for their potential involvement in I-RTX action. I-RTX shows species-specific activity on TRPV1, as well. The effect of the 547 residue on the ability of I-RTX to antagonize the response of TRPV1 to 500 nM CAPS was also challenged. As for RTX, the antagonist I-RTX was found to be significantly more potent at the rat receptor versus human receptor. After substitution of the rat-specific Met into the human construct (L547M), I-RTX gained functional potency, although the converse change (M547L) showed little effect (Figure 1). Introduction of the Met residue thus enables the human receptor to interact more effectively with both agonist and antagonist alike in a manner that is not matched by Leu. S512Y was found to convert I-RTX from an antagonist to an agonist with nanomolar potency, albeit with much lower efficacy than its counterpart (RTX) for the wild type channel. Other agonists such as CAPS or acidification with pH 5.8 was shown to enhance the agonist potency of I-RTX, producing a 20-fold decrease in the EC50 value . D646N was reported by Garcia-Martinez et al. to decrease the efficacy of RuRed to block the channel by 10-fold  (Figure 1). Venoms from spiders, snakes, scorpions and cone snails can cause burning pain. Small peptides, named vanillotoxins (VaTx) and “double-knot” toxin (DkTx) were indentified as TRPV1 agonists from the venoms of the spiders Psalmopeous cambridgei and Ornithoctonus huwena, respectively. Alanin scanning of the region S592-A665 revealed three sites (I599A, F649A, and F659A) where alanin substitutions caused reduced toxin responses (Figure 1). A657P and A657W also showed loss of toxin sensitivity. Xenopus laevis xTRPV1 also contains Pro at the extracellular boundary of the S6 domain, corresponding to amino acid A657 of rTRPV1, and is insensitive to VaTx or DkTx, but responds to CAPS and low pH. The reciprocal mutant (P663A) conferred toxin responsiveness of the frog TRPV1. The quadruple mutant (I599A/F649A/A657P/F659A) completely eliminated toxin sensitivity [198, 199]. The venom from the spider Agelenopsis aperta, a North American funnel web spider, contains potent inhibitors of TRPV1. Two acylpolyamine toxins, AG489 and AG505, inhibit TRPV1 from the extracellular side of the membrane . To identify mutations that alter these toxin affinity, Kitaguchi and Swartz  Trp scanned the TM5-TM6 linker region from Y627 to E651, mutating 25 consecutive residues to Trp. Of these mutants, 15 resulted in channel expression that could readily be studied by using electrophysiological techniques, whereas 10 produced little or no CAPS-activated current and were not studied further. One residue in this region (D646) was also mutated to Asn. The D646W mutant did not yield functional channel. N628W, E636W, D646N and E651W dramatically decreased toxin affinity. Mutations of Y627W , C634W and to a lesser extent F638W, L647W and F649W enhanced the sensitivity to the toxin . According to these results and previous studies on polyamine inhibitors of cation channels, AG489 seemed to be a pore blocker. A number of studies have demonstrated that the cytoplasmic regions of TRP channels bind agonists and regulatory molecules such as ATP, CaM and PIP2 [14, 95, 107, 201–204]. Kwak et al. found that D178N substitution abolished the ATP-mediated upregulation of TRPV1. Mutations generated by Lishko et al. , K155A and K160A, and the double mutation Y199A/Q202A impaired the TRPV1-ARD interaction with ATP. TRPV1 channels with mutations in the ATP-binding site (K155A, K160A, or Y199A/Q202A) showed little tachyphylaxis, even in the absence of ATP, while the two negative control mutants (R181A and K265A) had essentially wild type behaviour (Figure 1). The lack of tachyphylaxis shown by the TRPV1 mutants was not due to an impaired CAPS sensitivity; in fact, the mutant channels were slightly more sensitive to CAPS than the wild type channel [14, 46]. Ca2+/CaM has been reported to bind to peptides from the N-terminal region of TRPV1, and that the residues 189-221 are crucial determinants for binding . Grycova et al. found that the CaM-binding site overlapped with the PIP2-binding site in the C-terminal distal region (L777-S820) and that PIP2 interacted with the proximal region (I688-K718) of the TRPV1 C-terminal (Figure 1). Lishko et al. found that the TRPV1-ARD mutants K155A and K160A, which no longer bind ATP, did not interact with CaM in size exclusion chromatography, emphasizing that the binding surface on TRPV1-ARD is at least partially shared by both ligands. The TRPV1-ARD Y199A/Q202A mutant, where residues important for interactions with the adenine moiety of ATP were mutated, formed a weaker complex with CaM that eluted earlier than the complex with wild type TRPV1-ARD, still had a 1:1 stoichiometric ratio, suggesting that the different elution properties may be due to an altered conformation or binding constant, or higher-order (e.g., 2:2) complex . PIP2 has been shown to physically interact with a C-terminal fragment of TRPV1 . In the experiments of Brauchi et al. the mutation of the positively charged R701 and K710 to Ala strongly affected the PIP2-dependent activation, shifting the dose–response curves to the right along the concentration axis  (Figure 1). Grycova et al. showed that two different PIP2-binding sites on the C-terminus L777-S820 and the N-terminus F189-V221 overlapped with the CaM-binding sites, and the third PIP2-binding site K688-K718 occupied the TRP domain on the C-terminus, a highly conserved sequence among the members of the TRP ion channel family. The presence of PIP2 was reported to prevent the interaction of the distal region of the C-terminus with CaM, which could play an important role in the regulation of TRPV1. To identify the residues important for the binding of PIP2 to TRPV1-C-terminus, a set of point mutations was generated by Grycova et al., involving the single substitutions R778A and R781A, the double substitutions K770A/R785A, R771A/R781A and R771A/R778A and the triple substitutions K770A/R778A/R785A and K770A/R781A/R785A. The most striking effect was the total loss of binding affinity observed for the single mutant R778A, the double mutant R771A/R778A and the triple mutant K770A/R778A/R785A. Moreover, the K770A/R785A and R771A/R781A mutations decreased the binding affinity. The K694A/K698A/K710A triple mutant seemed to completely lose its ability to bind PIP2. Ala substitutions of the additional candidate residues in the highly conserved QRA region Q700A/R701A significantly attenuated its binding affinity for PIP2. These data show that the TRPV1 C-terminal proximal region (K688-K718) binds PIP2 directly with a high affinity and suggest that basic residues play a crucial role in the binding. The steady-state anisotropy measurements by Grycova et al. confirmed that the region denoted as a CaM interaction site F189-V221 binds PIP2 with high affinity. On the basis of their molecular model of the PIP2 interacting with the TRPV1 C-terminal distal region, Grycova et al. suggested that the phosphate head groups of PIP2 form polar interactions with positively charged Arg residues R778, R781, R785. PIP2 thus occupies the CaM binding groove containing R771, R778, R781, R785 described previously . Residues R778 and R781 were found to have key role in the binding of PIP2. Further combinations of Ala substitutions revealed that the TRPV1-CT distal region participates in PIP2 binding through a cluster of basic residues: the double and triple substitutions of R771A/R778A and K770A/R778A/R785A avoided PIP2 binding totally, and the K770A/R785A and R771A/R781A mutations suppressed this interaction partially. Site-directed mutation of R701 Arg reduced the binding affinity for PIP2. The triple substitution at positions K694A/K698A/K710A had the most pronounced effect, preventing PIP2 completely from binding to this region. The regions F189-V221 within the N-terminus and K688-K718 and L777-S820 within the C-terminus are involved in PIP2 binding. Interestingly, the F189-V221 and L777-S820 regions overlap with the CaM-binding sites, suggesting that CaM and PIP2 compete for the same binding site, which might have implications for regulation of the channel function. R778A was found to have the key role in the interaction. This single mutation leads to a total loss of binding affinity of the distal C-terminal region . DTT, an agent that maintains the -SH groups of Cys in a reduced state, has been reported to facilitate membrane currents through TRPV1 when applied from the extracellular face of the channel, by interacting with the residues at positions C616, C621 and C634 in the loop between the fifth and sixth transmembranal domains  (Figure 1). Site-directed mutagenesis experiments in the pore loop have identified C621 as the residue responsible for the extracellular modulation of TRPV1 by reducing agents . Mutations C616G and C634G did not affect DDT potentiation at 45°C, but C621G and the triple mutant C616G/C621G/C634G significantly reduced DDT potentiation without having any effect on the CAPS, heat or voltage gating of the channel [78, 112]. Using measurements of CAPS-activated currents in excised patches from TRPV1-expressing HEK293 cells, Picazo-Juárez et al. showed that enrichment with cholesterol, but not its diastereoisomer epicholesterol, markedly decreased wild type rTRPV1 currents in the presence of CAPS, elevated temperature or voltage. Substitutions in the S5 helix by Picazo-Juárez et al. , R579D and F582Q, decreased the cholesterol response and L585I was insensitive to cholesterol addition (Figure 1). Two hTRPV1 variants, with different amino acids at position 585, displayed different responses to cholesterol, with hTRPV1-I585 being insensitive to this molecule. However, hTRPV1-L585 was inhibited by cholesterol addition similarly to rTRPV1 with the same S5 sequence (containing L585). In the absence of CAPS, cholesterol enrichment also inhibited the TRPV1 currents induced by elevated temperature and voltage. The amino acids in positions K571, R575 and R579 were confirmed to be involved in TRPV1-lipid interactions [172, 191]. Phosphorylation by PKC, which potentiates CAPS, acid, and thermal responses in TRPV1 channels, occurs at two target Ser residues (S502 and S800) [78, 85, 209] (Figure 1). Residues located in the N-terminus of TRPV1 (S116 and T370) are phosphorylated by PKA and have been implicated in desensitization [85, 176, 210] whereas residues T144, T370 and S502 have been implicated in the sensitization of heat-evoked TRPV1 responses when phosphorylated by PKA [78, 83]. Phorbol 12-myristate 13-acetate (PMA), a PKC-activating phorbol, was observed to decrease the binding of [3H]RTX to TRPV1  through interaction with Y704 in the C-terminus [46, 85]. The site-directed mutation of residue S116A performed by Wang et al. was reported to block both the phosphorylation of rTRPV1 by PKCμ and the enhancement by PKCμ of the response of rTRPV1 to CAPS. Ser116 is also a major phosphorylation site in TRPV1 for PKA, and this site has been shown to be involved in TRPV1 desensitization . Numazaki et al. observed that, when S502 and S800 residues were replaced with Ala, the TRPV1 activity induced by CAPS, protons or heat was eliminated . S502A was found to significantly reduce PMA enhancement of CAPS-evoked currents, but had no effect on direct activation by PMA . CaMKII regulates TRPV1 activity through the phosphorylation of two residues: S502 and T704[46, 91]. Phe mutations of the hTRPV1 Y195, Y199, Y375, Y383 and Y402 did not diminish Src kinase dependent phosphorylation. But when Y200 (corresponding to Y199 in rTRPV1) was mutated, Src-dependent, NGF-induced Tyr phosphorylation was completely abolished . A glycosylation site (N604) was identified by Wirkner et al. [172, 212]. Site-specific analysis has shown that substitutions of D646 or Y671 in the pore domain can reduce the permeability of divalent cations [176, 197] (Figure 1). This cation selectivity is dynamic, not static, and can vary depending on the stimulus duration or agonist concentration. Activation can alter the Ca2+ permeability and pore diameter of TRPV1 to allow influx of larger cations. This change in permeability is mediated by amino acid residues in TM6. Within this domain, L681 can regulate the permeability of large cations, while Y671 gates the access of smaller cations [169, 178]. Our group discovered a blocking effect of divalent heavy metal cations and especially of Co2+ on rTRPV1 . The effects of the cations were evaluated in rTRPV1 containing mutations reported earlier in context of proton activation and tarantula toxin effect. The Co2+ sensitivity was slightly reduced in the D646N mutant. The Y627W, N628W and E651W mutants displayed little or no difference as compared with the wild type channel . Deletion studies have shown that the C-terminal TRP domain (E684-R721) regulates the formation of functional channel tetramers . Removal of this region prevents the oligomerization into stable TRPV1 heteromers . Constitutively active TRPV1 mutants might harbor deficits in some aspect of channel activation, and a comprehensive list of such mutations could provide valuable information about the location of the channel gate. Jordt et al. showed that HEK293 cells expressing E600Q TRPV1 channels showed markedly reduced viability. Replacement of this Glu residue with Gln (E600Q) or a positively charged amino acid (E600K) resulted in a significant level of cell death in HEK293 cells expressing these mutant channels, over their heightened activity under normal culture conditions, whereas substitution with an acidic residue (E600D) was not deleterious (Figure 1). This observation suggested that a decrease in negative charge at the E600 site favours channel activation. The E600K mutant showed a most dramatic sensitization phenotype. These channels were already activated at temperature thresholds (30–32°C) well below normal (43°C), resembling the heat sensitivity of wild type channels at pH 6.3 . By genetic screening of a randomly generated population of TRPV1 mutants, Myers et al. demonstrated that mutations within the pore helix domain dramatically increased basal channel activity and responsiveness to chemical and thermal stimuli. The screening for gain of function mutations revealed a total of 30 unique mutations at 25 amino acid positions: C73S, K160E, S343R, A350T, Q561R, M581T, M609T, F640L, N652D, L673I, E684G, E684V, K710R, F742S, W787R and L796P caused strong toxicity when expressed in Saccharomyces cerevisiae, whereas other gain of function mutations I75F, I76T, V78G, K155E, H166R, N310D, S343G, I352N, I352T, Q560R, M609V, I689V, L792P and L796V elicited weak toxicity to the cells. Some mutants displayed large basal currents at pH 7.4, which could be blocked by RuRed. The authors classified mutants as constitutively active when the ratio of the basal inward currents and the CAPS-elicited currents exceeded 0.15 (Ibasal/Icap ≥ 15%). The mutants K155E, K160E, M581T and F640L achieved a rank constitutively active. F640L displayed the strongest basal channel activation, and conferred substantial toxicity when expressed in HEK293 cells, characterized by necrotic morphology similar to that observed in cells expressing wild type TRPV1 after prolonged exposure to CAPS. Inclusion of RuRed (3 mM) in the culture medium significantly attenuated the death of F640L-expressing cells. Inside-out patches from the F640L mutant displayed large basal currents with a substantial inward component but CAPS at saturating concentrations elicited currents of similar magnitude to those evoked in patches containing wild type channels. Myers et al. found no significant difference in either the single-channel conductance or the relative permeabilities for Na+, K+, and Ca2+ ions when comparing wild type and F640L mutant channels, showing that the F640L mutation affects gating rather than permeation properties. Consistent with a hypersensitive gating mechanism, F640L mutant displayed a 35-fold leftward shift in the CAPS dose-response curve compared to the wild type receptor, the basal current however, was suppressed by CapZ demonstrating that the high constitutive activity is not due to an inability of the channel to close. Consequently, the gating machinery seems to remain intact in the F640L mutant, but the equilibrium appears to be shifted to favor the open state. F640L mutation enhances sensitivity to heat and CAPS by shifting the stimulus- response relationships of the channel leftward while also decreasing apparent cooperativity of gating. To fully explore the structural requirements at position F640 a codon randomization was performed. Most substitutions at this position, particularly those of a hydrophilic nature, weakened or abolished channel activity. F640K, F640Q, F640S, F640H, F640Y weakly, whilst F640C, F640E, F640G, F640N, F640R, F640D, F640P strongly decreased channel function. Furthermore, F640A and F640T represented an intermediate phenotype between wild type and weak loss of function. In contrast, several hydrophobic amino acids supported wild type functionality (F640M, F640V, F640W), except for Leu and Ile, which produced constitutively active channels (F640L, F640I). Thus this codon randomization illustrated that most hydrophobic substitutions at F640 produced functional channels, whereas two small hydrophobic residues supported constitutive channel activity, suggesting that F640 is buried in a non-polar environment. Myers et al. uncovered nine additional substitutions conferring a toxic phenotype in yeast (N625D, N628D, C634S, T641S, T650S, K656E, K656Q, V658A and F659Y). These mutants were unable to grow on replica plates containing CAPS but no RuRed. Of these, two (T641S and T650S) showed high basal activity. Interestingly, T641S (and, to a lesser extent, T650S) mutants displayed large constitutive channel activation with relative insensitivity to pH 6.4 . The E610Q mutants exhibited relatively small responses to any stimuli (CAPS, heat or pH), suggesting that this substitution had deleterious effects on the channel function at large . The function of the channel appeared quite sensitive to perturbations at the position V538 (Figure 1). Substitution with Gly (V538G) resulted in non-functional channels . Susankova et al. mutated and examined the residues Y666-G683 of TRPV1. Y666A and N676A showed no CAPS-, pH- or heat-evoked activity and exhibited no currents in response to 47°C and 30 μM CAPS applied together. They were determined to be non-functional mutants, suggesting that these two residues within the inner-pore region of rTRPV1 are critical for channel functionality. Boukalova et al. identified mutations Y554A, Y555S and E570L and two charge-reversing mutations, R557E and R579E, that led to a complete loss of function. In these mutants, 10 μM CAPS neither induced measurable currents at a holding potential of −70 mV, nor affected voltage-dependent (up to +200 mV) or heat-dependent currents (up to 48°C). The Y554F and Y555F mutations produced fully functional channels, indicating that aromatic side-chains are required at these positions. Ryu et al. investigated mutations of other residues (D601-S611, Y627-F640 and D646-E651) that had minimal consequences, leaving CAPS and low pH responses mostly intact. These included radical perturbations such as the charge mutations N628R and S632D, suggesting that these residues are probably exposed to the aqueous phase. Such an arrangement would be consistent with their positions in a helix, which renders T633 facing away from the aqueous phase, making it accessible to interaction with other residues . The function of the channel appeared quite sensitive to perturbations at the position 538 (V538L, V538A, V538G, V538I, V538T). Even the relatively conservative substitution with Ala abrogated the low pH currents and also reduced the CAPS activity. Further reduction of the size of the side-chain with a substitution by Gly resulted in non-functional channels. It appeared that the local structure of the channel lacks rigidity to tolerate a smaller side-chain at this position. However, the size of the side-chain was not the only factor determining the function of the residue. Replacement by Ile, which has the same volume as Leu, recovered a small, but significant portion of the low pH activity. The data appeared to consist of two populations, one similar to the wild type and the other to V538L, as if the local structure of the channel existed in some metastates. Finally, Thr substitution, which preserved the side-chain size, did not confer the wild type responses either. Together, these data indicate that multiple aspects of the side-chain, including both volume and steric hindrance are important for the function of the residue . An N-terminus deletion mutant by Jung et al. , Δ1–109, which elicited Icap, retained specific binding for [3H]RTX. In contrast, cells expressing Δ1–114, which failed to show Icap, completely lost their specific binding to [3H]RTX. Similarly, deletion mutants at the C terminus, such as Δ762–838 and Δ763–838, which displayed smaller Icap, bound [3H]RTX similarly to the wild type. In contrast, Δ761–838, which failed to elicit Icap, had no ability to specifically bind [3H]RTX. Deletion mutants that lacked one of these two regions lost current sensitivity to CAPS and the ability to bind ligands. The two regions in the vicinity of R114 and E761 are critical for ligand binding and that the loss of these regions abrogates vanilloid activation. A deletion as small as a single amino acid affects the ligand binding. Δ114 and Δ761 failed to elicit CAPS-sensitive inward currents. Furthermore, the mutants did not show specific binding to [3H]RTX. Both mutants elicited whole-cell currents when activated by heat at ~46°C, but both mutants failed to respond to acid (pH 5.5) . Deletion of a Thr residue in TM4 (ΔT550) reduced CAPS sensitivity  (Figure 1). To investigate the contribution of the pore turret to the TRPV1 function, Cui et al. generated a series of turret deletion mutations by deleting the first 10 (ΔG603-S612), 17 (ΔG603-G619), or all 24 amino acids (ΔG603- N626), and also deleted seven amino acids from the C-terminal end of the turret (ΔS620-N626). ΔG603-S612 mutant channel was found to be functional, and exhibited nearly identical CAPS sensitivity to that of the wild type. As CAPS exhibited very similar potency and efficacy in activating wild type and ΔG603-S612 channels, this partial turret deletion does not seem to directly affect CAPS activation. ΔG603-S612 reduced the heat response of the channel, which was not a result of slow gating kinetics, as lengthening the heat pulse did not yield any increase in the current amplitude, heat becomes a less effective activator for the ΔG603-S612 mutant channel. Cui et al. found that, the turret deletion mutations ΔG603-G619 and ΔG603-N626 completely disrupted channel function; no current could be detected from channel-expressing cells challenged with either 10 μM CAPS or high temperatures up to 50°C despite the normal cellular distribution of the mutant channels similar to that of the wild type TRPV1 . This work was supported by grants from the National Office for Research and Technology (OMFB-01630; OMFB-01703, OMFB-01576/2006 and BAROSS_DA07-DA_TECH_07-2008-0043). ZO was supported by Marie Curie European Re-integration Grant MCIRG030854-PAINKILLER; Ányos Jedlik Program NKFP-1-00019/ 2005; GVOP-3.3.1-05/1.-2005-05-0057/3.0, and BAROSS_DA07-DA_TECH_07-2008-0028. CV was supported by grants from the National Office for Research and Technology (OM-00051/2005, OMFB-01575/2006, ERC_HU_09 3D_TRPV1 OMFB-01813/2009 and TÁMOP-4.2.1.B-09/1/KONV) and the Hungarian Ministry of Health (552/2006). GS and CV are grateful for the award of Bolyai Fellowships of the Hungarian Academy of Sciences. The authors would like to express their appreciation to our native speaker lector for proofreading the manuscript. ZW designed the study prepared the manuscript the figure and the table. AB, FÖ, KJ and CV have been involved in drafting and revising the manuscript. GD, GS and ZO have been involved in revising the manuscript and in the interpretation of data. All authors read and approved the final manuscript.